https://www.youtube.com/watch?v=RMt1qhQkqd4 A natural overdrive and clean boost for the tone conscious player to enhance the original sound of an instrument and amp while retaining their essential character. Its gain stage, treble control and signal path are optimized for bass guitar and guitarists wanting extended low frequency response. An adjustable clean blend assures an articulate, full tone while boosted power rails deliver extended headroom. EHX Founder and President, Mike Matthews, stated: �Our Soul Food put �Klon-like� transparent overdrive into the hands of players at an unprecedented price point. Now we want to bring that to bass guitarists and guitar players who want more low-end definition. The Bass Soul Food delivers a wide range of overdrive and clean boost sounds, and has plenty of volume to assert your place in the mix. It will give your tone a lift in all the right places!� Selectable true or buffered bypass modes and a switchable -10dB pad for active instruments complete the package. 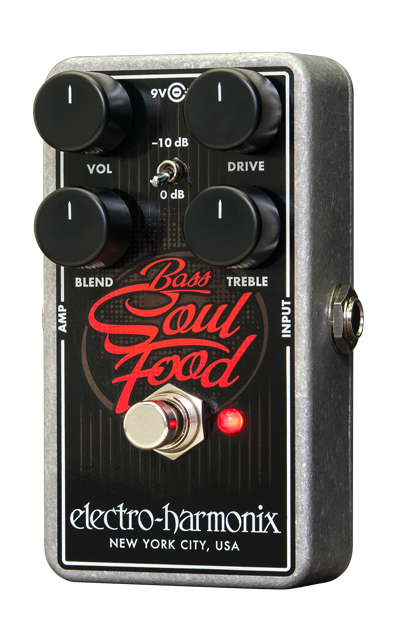 Bass Soul Food runs on a 9V battery and ships with a EHX9.6DC-200 power supply.